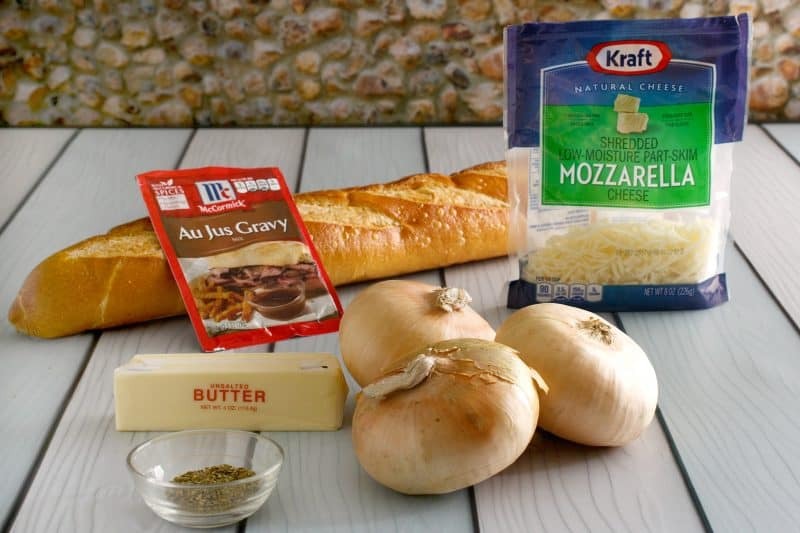 This Restaurant Style French Onion Soup is a deeply flavorful french onion soup, perfect on it’s own or topped with toasted bread and a handful of mozzarella. We are finally getting those nice fall-ish temperatures on a regular basis. In North Alabama that means it is under 90 degrees. We sure are grateful for it. This weekend marks the official Fall kickoff for us because the Old Timey Fiddler’s Convention takes place in nearby Athens, Alabama. It’s one of my absolute favorite festivals of the year and just filled with wonderful music, food, and crafts. Having said that, oddly, I’m not sure if we are going to go this year. My husband and I have found ourselves craving more time at home, sitting on our back porch and enjoying coffee and conversation together. We even decided to forego our usual fall break trip with the kids and instead take a few days off of work just to be together and enjoy our home. I’m gonna tell you what, we are just enjoying the mess out of this age and stage in our lives. The recipe I’m sharing with you today is simple, easy, and probably one of the most flavorful soups you’ve ever tasted. 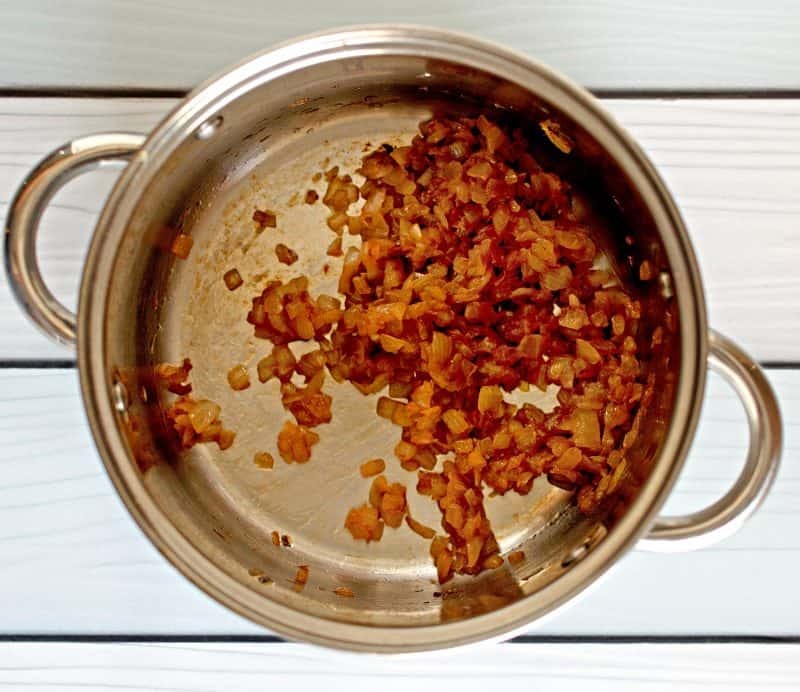 The most work you have to do is brown and caramelize your onions but other than that, it’s just a matter of stirring a pot. I love this beefy flavored soup and know you will, too. It’s the perfect way to welcome cooler temps and a single recipe makes the perfect amount for two but doubles, triples, and even quadruples well. You’ll need: butter, sweet onions, Au Jus Gravy Mix, and water. Optional but good: dried basil, baguette bread, and shredded mozzarella. In medium sauce pot, melt butter over medium high heat. Add onions and cook, stirring often, until caramelized and lightly browned, about 20 minutes. Hang in there because this step takes the longest but makes the biggest difference. Stir in dried basil (if using) and cook a minute or two more. In 2 cup measuring cup, add 1 cup cold water and packet of au jus mix. Stir vigorously with a fork until well combined and smooth. Pour into pot along with remaining 2 cups of water. Bring to a boil while stirring often. Once boiling, reduce heat and simmer about five minutes. Serve immediately or follow instructions below if you’d like to serve it restaurant style. 1. Divide soup among four oven safe bowls, top each with a piece of toasted bread and a nice sprinkling of mozzarella. 2. Place on baking sheet and put in oven under a low broiler just until lightly browned on top (3-4 minutes). Serve immediately. Tip: I like to double the recipe and put the rest in the fridge to heat up for a quick lunch. When I refrigerate it, I just leave the bread off and when I reheat it, I usually just toss in a handful of cheese (still no bread) for a lower carb meal. Put this one on your “Must Make Soon!” list! 1 teaspoon dried Basil optional, but good! In medium sauce pot, melt butter over medium high heat. Add onions and cook, stirring often, until caramelized and lightly browned, about 20 minutes. If you'd like, stir in dried basil and cook a minute or two more. In 2 cup measuring cup, add 1 cup cold water and packet of gravy mix. Stir vigorously with a fork until well combined and smooth. Pour into pot along with remaining 2 cups of water. Bring to a boil while stirring often. Once boiling, reduce heat and simmer about five minutes. Serve immediately or follow instructions below if you'd like to serve it restaurant style. Divide soup among four oven safe bowls, top each with a piece of toasted bread and a nice sprinkling of mozzarella. Place on baking sheet and put in oven under a low broiler just until lightly browned on top (3-4 minutes). Serve immediately. Looks wonderful! Can’t wait to try it…. Hi Christy i have not commented for awhile, I have struggled with a bit of depression but am on the mend again, I love reading your stories with the recipes and agree with you that chilling out at home can revive the soul especially as you have Rickie to chat with that would be so relaxing, god bless from Judi. That looks so good! Thank you for sharing. May God bless you sweet woman!!!!! Love that your recipe doesn’t make a large pot. I love French onion soup, but my go-to recipe just makes too much. Will definitely be trying this! Thanks!! Hey Christy. I love the Au Jus gravy mix. I sometimes use that in place of beef broth and consommé, because it has such a rich flavor. Your version sounds delish and very quick compared to the other where you have to caramelize the onions FOREVER! LOL I have tried the other versions before and just gave up saying that’s as brown as they are gonna get right now! I want to eat sometime today. Our Wal-Mart used to carry the French baguettes, but lately have not. I hope they start carrying it again. I made your apple dump cake a few weeks ago and it was delish! I came across one of your recipes for chicken and wild rice casserole that sounded so good, so I’m probably gonna make that this weekend. All the comments raved about it, so I’m sure it’s a keeper. 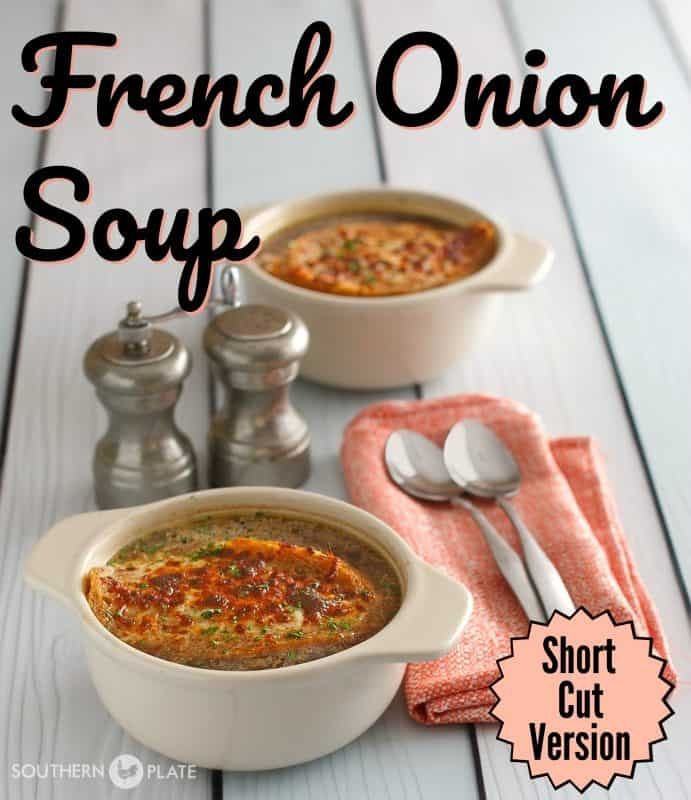 I love French Onion Soup but never made it. I will certainly try this! Also I need another copy of your first book. I gave mine to my sister-in-love because she loved the Apple Dapple Cake I made from there. Where can I get another copy, hopefully autographed like the first one? Oh my word. This looks so easy….got to give it a try very soon. I made your Chicken with Sour Cream Gravy tonite. Boy, was it good. Hooray! 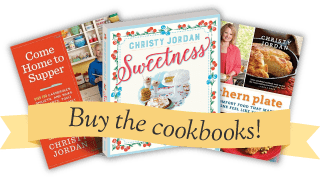 A low-carb recipe that I can find all the ingredients for locally…. that’s a minor miracle for which I’m grateful. Thanks for sharing, can’t wait to try it! I’m suspcious of gravy mixes. My mama would tan my hide if she caught me using one. I think I’d rather use 4 cups of beef broth or stock and two or three cubes of beef Bouillon, and cook it down slow. Hmmmm I was wondering the same thing. The Au Jus mix is delish and has a MUCH better flavor than bouillon. I just wouldn’t tell Mama! Do you use a particular band of bullion cubes? I don’t’. I typically use whatever I grab first. Use the bouillon if you must, but then it’s not a quick recipe anymore. You are talking hours of cooking. 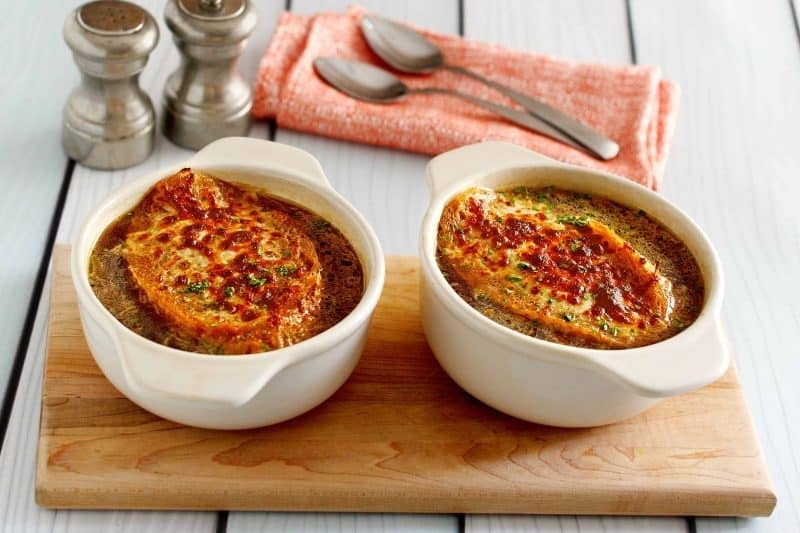 This is a great way of having french onion soup whenever the mood may strike, say at midnight. I’ve never made French onion soup but do love it. Going to try it soon. Thanks. I cant wait to hear how you like it Margie!! Yum, enjoyed every bite. Thank you, Christy! I am so glad you liked it Kathy!! This looks so yummy – and it’s a very easy recipe! Thanks! It is easy and delicious, I hope you will give it a try Cyndy!